Starting seven ashrams and a convent in different parts of Kerala, Chavara initiated a spiritual movement among the people of Kerala. 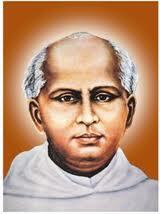 He established the first Catholic Sanskrit School, a major seminary and a printing & publishing house at Mannanam. He directed that every church should start a school attached to it and encouraged children even poorer sections to attend the schools by supplying midday meal and dress for them. He founded a ‘Home of Charity’ to take of the destitute, the beggars, the uncared sick and the old. He also organized the first voluntary charitable association in Kerala for self-help among the needy.